If you haven’t seen the HEAVY METAL NINJAS live before then picture this… five guys in ninja attire, uber heavy riffs, laser lights and not a vocal to be heard. This is purely a visual / instrumental spectacle. It’s definitely not something you see every day and the question I’ve kept asking myself up until now is how would it all translate on a recording? Well the debut Heavy Metal Ninja’s EP is now here and the answer to that question is “mighty fine” apparently! Opener ‘The Author’ is a heavy prog metal track harking back to the early work of virtuosos Marty Friedman and Jason Becker. Come to think of it those guys even had a song called ‘The Ninja’! Still with that nostalgic vibe but this time in the vein of Steve Vai / Joe Satriani, ‘What If’ begins with the less is more approach – clean, bright guitar licks which increase in complexity as the song goes on. You can really feel the heart put into this track as Riche lets loose on the guitar. Those are two great songs, but this is an album of two hemispheres and the best is yet to come! The last two ‘M45’ and ‘Redshift’ are distinctly more modern in feel and it makes sense since they were written more recently than the first two. If this EP had a title then ‘M45’ would most likely be it. Named after one of New Zealand’s most prominent night time features the plieades star cluster (and the home to ancient aliens depending on who you ask) this is also the main feature on the cover artwork. The spacey synthesizer intro soon gives way to beasty riffs, melody and atmosphere like what you’d hear on the greatest works of Swedish bands SOILWORK and IN FLAMES. I think the best is saved until last on this recording though. It sounds like the 8-string has been busted out to lay down the riffs for ‘Redshift’. Imagine the music of djent masters like MESHUGGAH, PERIPHERY and ANIMALS AS LEADERS overlaid with wild sweep picking and a bunch of other cool lead guitar work. 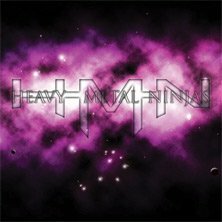 Well written, well recorded and well presented this is the ultimate taster for a planned full-length recording due from the HEAVY METAL NINJAS sometime this year. Bring it on!